TeamNL driver Rinus VeeKay scored his second podium of the season after finishing in second position in the first race of round two of the Indy Lights Championship Presented by Cooper Tires. At Circuit of The Americas the 18-year-old driver from Hoofddorp in the Netherlands impressed in the first race with some great overtaking maneuvers. Starting from sixth position on the grid, the Juncos Racing driver claimed a hard-fought second position. In the second race VeeKay had to catch up from seventh position after a bad start and finished just outside the podium in an also hard-fought fourth position. “The first race was absolutely great, but I’m less happy with the second race, but sometimes you have to deal with these kind of races,” said VeeKay, who is in second position in the championship, only six points short of the leader. Circuit of The Americas, the 3.41-mile road course in Austin Texas, and also home of the Formula 1 USA Grand Prix, was host to the second round of the Indy Lights Championship Presented by Cooper Tires. 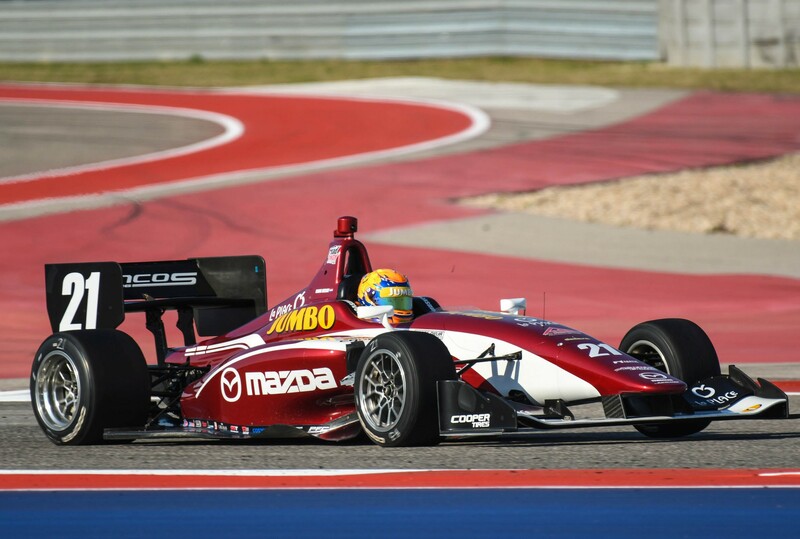 After his great Indy Lights debut in St. Petersburg, where TeamNL driver Rinus VeeKay claimed a dominant victory in the second race of the weekend, the 18-year-old racing talent from Hoofddorp in the Netherlands impressed in Austin as well with his race craft and speed. But the start of the weekend was not as good as the Juncos Racing driver had hoped for. In the final stage of the first qualifying session, when all drivers recorded their best lap times, VeeKay suffered suspension damage, caused by the heat of the exhaust system, and dropped from second into sixth position. In the second qualifying session the TeamNL driver proved that the speed was not the problem as he recorded a lap time 1.3 seconds quicker than in the first session to claim the third qualifying position. In the first race of the weekend VeeKay once again proved his race craft and mindset and that giving up is not an option for the young Dutchman. Starting from the sixth position on the grid VeeKay took advantage of a crash in the first corner and was fourth after the first lap. While the top three created a gap, the Juncos Racing driver had to defend his fourth position. After a few laps VeeKay edged away and within four laps the Juncos Racing driver closed the 8-second gap to the battling drivers in the numbers two and three positions. After a great battle and an ever better overtaking maneuver, VeeKay took over the third position, and then gained one more position after another great move in the penultimate lap of the race. In the final lap of the race the young Dutch driver made no mistakes and claimed a hard-fought second position. “This was really the maximum I could achieve today. When I was in fourth position I had no one in front of me and couldn’t use push-to-pass in defending my position. I had saved my tires a bit more than the drivers in second and third position, and that gave me a little advantage to pass them,” said a happy VeeKay after the eventful first race of the Austin weekend. After a messy start of the second race, VeeKay dropped from third into seventh position. The young Dutchman regained two positions in the opening lap, but immediately dropped back into sixth position. When he tried to regain the fifth position, the Juncos Racing driver went wide, lost another position and was seventh. With a great maneuver VeeKay regained the sixth position and was fifth after one of the competitors in front of him suffered mechanical problems. In the lap after the restart from behind the safety car, VeeKay gained another position and was fourth. As the top three drivers were too far away, VeeKay finished in fourth position. “The bumps on the start line caused wheel spin and I had to lift as I hit the rev limiter. It took too much time to get out of the midfield. It was far more difficult than it was in the first race to overtake and gain positions, but with finishing fourth we didn’t lose too many points,” said VeeKay. In the championship standing after two rounds, VeeKay is still in second position, only six points short of the leader. The next round of the Indy Lights Championship Presented by Cooper Tires is at the Indianapolis Grand Prix Circuit, May 9th to 11th .